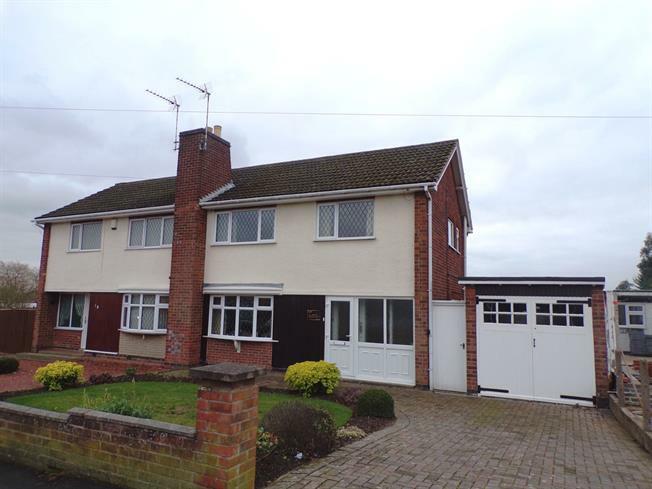 3 Bedroom Semi Detached House For Sale in Wigston for Guide Price £190,000. Located a short distance from the local primary school this lovely three bedroom property occupies a good size plot benefitting from off road parking and a single garage. The accommodation comprises of entrance porch, entrance hall, lounge diner, conservatory, kitchen, three bedroom, family bathroom with separate WC. Generous and established rear gardens with two lawns and several seating areas. UPVC double glazed door, opening onto the garden. Double glazed uPVC window with obscure glass facing the front. Single glazed wood window with opaque glass. Radiator, laminate flooring. Double glazed uPVC bay window with leaded glass facing the front overlooking the garden. Radiator. UPVC double glazed door. Double glazed uPVC window facing the rear overlooking the garden. Vinyl flooring. Roll top work surface, wall and base units, stainless steel sink. Double glazed aluminium multiple styles of window. Vinyl flooring. Double glazed uPVC window facing the front overlooking the garden. Radiator, built-in storage cupboard. Double glazed uPVC window with obscure glass facing the rear. Radiator, vinyl flooring. Panelled bath with mixer tap, shower over bath, wash hand basin with mixer tap. Double glazed uPVC window with obscure glass facing the side. Vinyl flooring. Low level WC. To the front of the property is a lawned garden enclosed with a low level brick wall, block paved driveway leading to a single garage with up and over door, side gated access leading to the rear garden which is generous in size, shaped lawn areas, borders filled with plants and flowers, gravel beds and further patio areas.